Ahh…the good old claw hammer. Such a wonderfully ubiquitous construction tool. Especially if you’re just putting up a picture on the wall, doing a quick repair on something, or just venting your frustration. But seriously, if the job is more involved, and you’ll be hammering away until you’ve got a headache, you’ll really want to get a nail gun or nailer. Not only does a nail gun save you a hell of a lot of time, you’ll save yourself the headache as well. 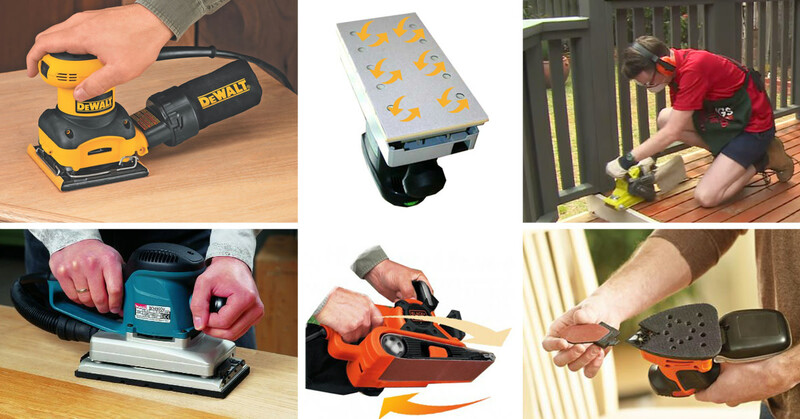 Instead of multiple taps to get than nail in, you’ll need only one from the nail gun—pow!—and it’s in. One is dual-contact firing, where the nail will fire as long as you hold down the trigger and press the nosing against the work. This allows you to fire a nail, move to the next spot and continue with a series of nails without having to release and re-press the trigger each time. The other is sequential firing, which is a bit safer. This requires that you release the trigger first, before each nail is fired. The nosing must be pressed onto the work before the trigger will function. Improvements in safety of nail guns is ongoing. Below, you'll find a list of different types of nail guns you might choose, and a description of what each one is good for. Let’s start with the heaviest duty nailer..the framing nailer. 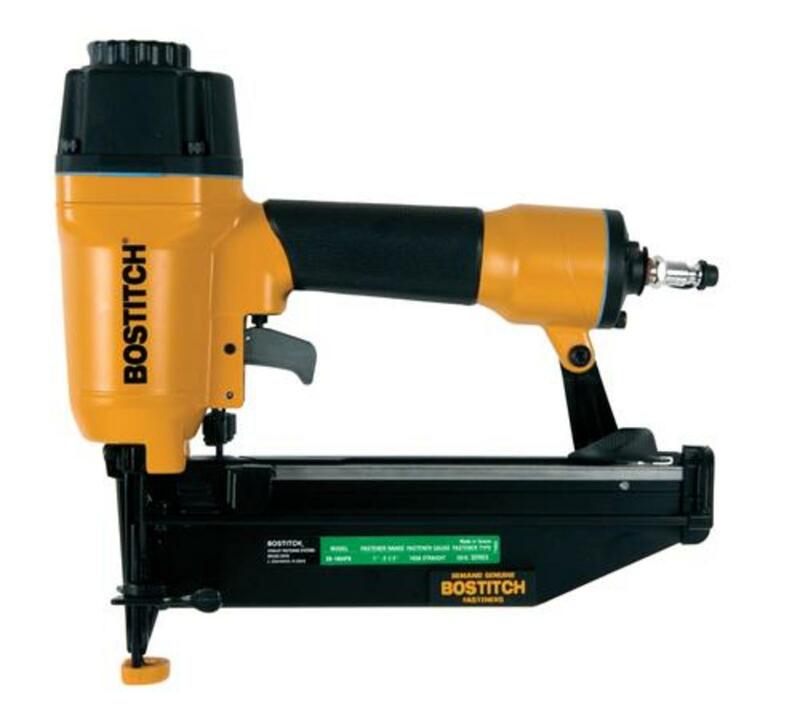 As the name suggests, this type of nailer is used for wood framing in a building and heavy construction. This type frequently requires up to 3½” nails to join 2x4s. Heavy-duty is the order of the day. All these models offer switchable contact or sequential trip, and tool-free depth-drive adjustment. This generally uses shorter nails with larger heads, and can also be used for siding and similar materials as well. The nails usually come on a coil. These models also offer switchable contact or sequential trip, and tool-free depth-drive adjustment. These are specially designed to make laying tongue-and-groove floor boards simple and fast. You won’t have to wear out your knees. You simply hold the nailer against the edge of the board and a moderate whack on the plunger with the nylon mallet, and the nail is in, at the right angle and the right depth, every time. This uses shorter, lighter gauge nails, usually 14 to 16 gauge, 1” to 2½” nails. This is used for mouldings around windows and doors, baseboards, chair rails and such, as well as cabinet making. 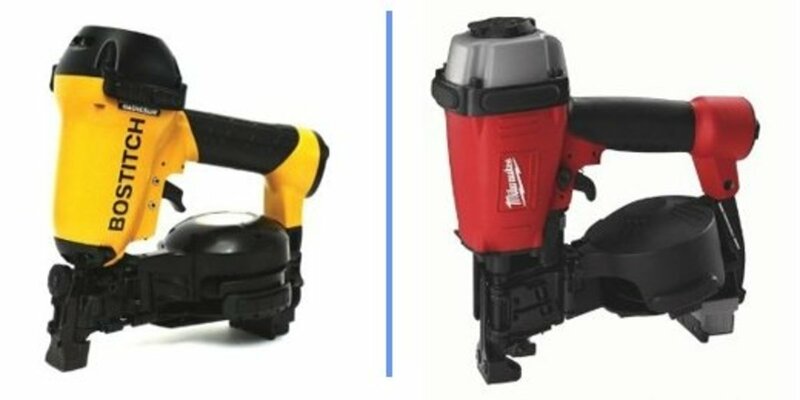 Finishing nailers are available both as air compression and as cordless nailers. A lighter duty nailer is a brad nailer for 18-gauge nails, 5/8” to 2”. Brad nailers differ from the finishing nailers mostly by the fact that the nail magazine is not angled as with finishing and framing nailers. The brad nailer is usually used for smaller wood projects, upholstery, and other such precision work. While the brads are small and leave a fairly tiny hole to fill, they hold really well. As with most nailers these days, all these models offer switchable contact or sequential trip, and tool-free depth-drive adjustment. The cordless nailers are currently more expensive than the pneumatic models, but of course they don’t require that you have a compressor or a hose to deal with. Some cordless nailers use a fuel cell for nail propulsion, which needs to be replaced every 500 nails though, so you have to take that cost into account. The battery-charged models don’t have such a requirement. The cordless, use-it-anywhere aspect is the real selling feature here, much like cordless drills have freed up the necessity of a power cord. Any tool can be dangerous in the wrong hands. This is especially so for power tools. While nail guns have been designed to not fire unless the pressure tip is first pressed against the work, you can still accidentally tap it against something if you’re pressing the trigger as well (see dual-contact firing, just below). Be alert at all times...please. While nail guns (or nailers) have been around for about 25 years, many refinements have been made. Newer materials like magnesium and aluminum alloys have made the tools lighter. Plus more attention has been paid to ergonomic design, so that the tool is properly balanced and easier to grip. Adjusting the firing method no longer requires a special tool. Adjusting the depth of the nail no longer requires adjusting the air compressor. Cordless models which don’t require a compressor, and therefore a hose are now widely available. 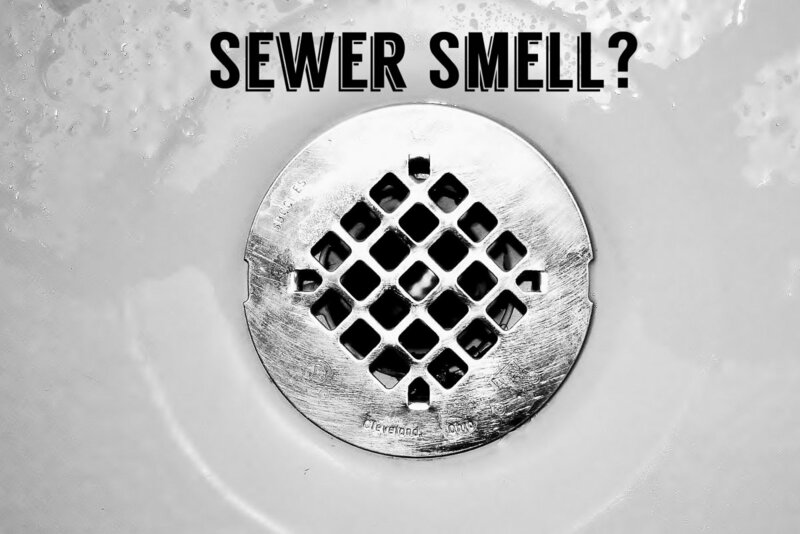 Whether you’re a professional contractor or a DIY homeowner, you’ll find you get the job done in less than half the time it would have taken with a hammer and nails. Many of these nailers could pay for themselves in no time. I have 10mm oak flooring board which have lifted. I need to nail these boards firmly down into the solid concrete building slab, which is very tough. Additionally, I do not want a huge hole or mess ontop of the oak floorboards for me to have to spend a huge amount of time & effort to fix. 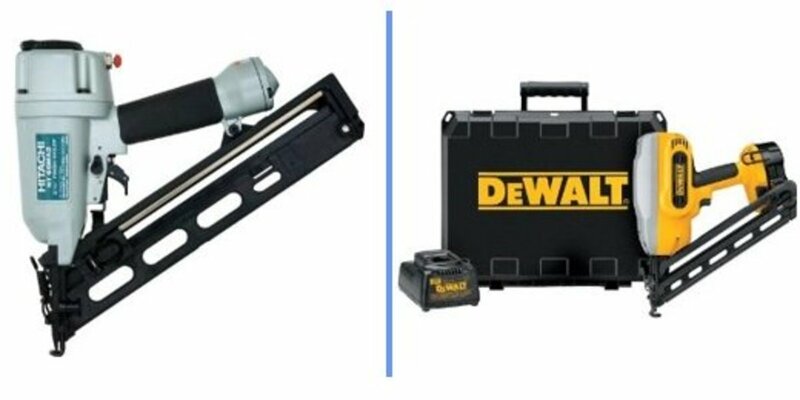 I prefer electric, so which nail gun & nail type should I be looking at purchasing? The issue of laying wood flooring on top of a concrete slab is a complex one. You should check with your local municipality for building codes, or hire a contractor that is knowledgeable in this type of installation. It also depends whether the concrete is above or below grade. In general, however, it involves making sure the concrete is completely dry, then laying a 6-mil vapor barrier on top. Then laying plywood planks on top of this, using concrete screws to fasten the plywood to the slab. You can then install your flooring in the normal way. A flooring nailer is the best type to use. They do come as electric nailers. Check out your local building center. can I use a finishing nailer for strapping a wall? Yes, you can use a finishing nailer as long as it's not a brick wall you're nailing into. In that case, you should use concrete screws such as TapCon. I'm going to install a tongue and groove ceiling on a porch. What type of nailer should be used? It depends what is on the porch ceiling at the moment. If it is open studs, and the preferred orientation of the panels runs 90 degrees to the studs, then just use a finishing nailer, and about 1 1/2" (or longer) galvanized nails (assuming the panels are at least 1/2" thick). If the present ceiling is plywood over studs, make sure it is all solidly screwed or nailed into the studs first. Then use the nailer to attach the T&G panels. With a plywood ceiling, you have the option of orienting the T&G panels either way. 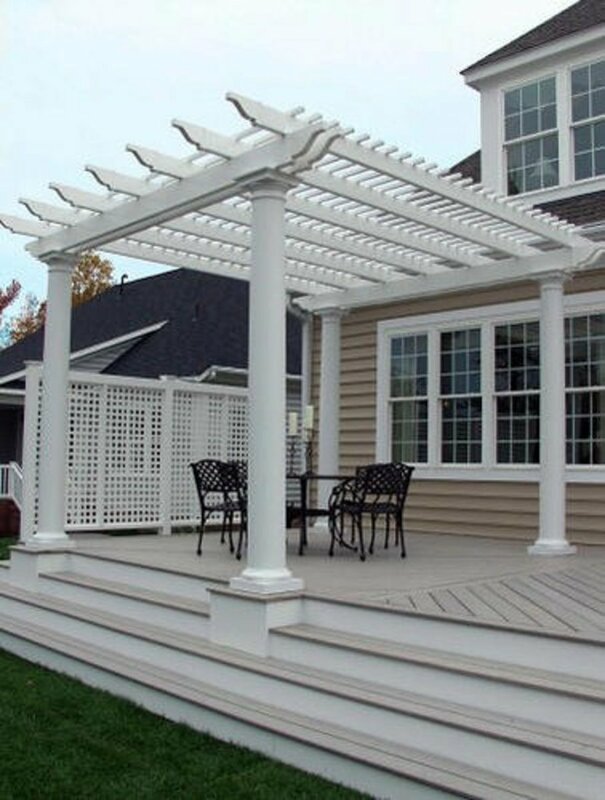 You should also pre-prime the panels with an outdoor primer or a good quality finish and/or stain on all sides before installing. What kind of cordless nail gun can switch between framing and finishing nails? To the best of my knowledge and research, you can't do such a thing. The shortest nails you can use with a framing nailer are about 2 3/8", and the longest nails for a finishing nailer are about 2". So you couldn't use the same nails in either type of gun. In other words, these nailers are both purpose-built, with no cross-over compatibilities. I want to install pine paneling measuring 5/16"x 3-1/2"x 8', over a Gyproc wall. What gun and nail size is best for this installation? Unfortunately, Gyproc is probably not solid enough to hold the nails. You could try it, but the nails may loosen over time. If you choose to go this route or use my next suggestion, a finishing nailer with 1-1/4" nails would do the job. Alternatively, you could use 1x3 strapping horizontally, spacing them every 12 to 16", over the Gyproc, making sure they are screwed into the studs behind. Then attach the panels with the nailer at the strapping points. 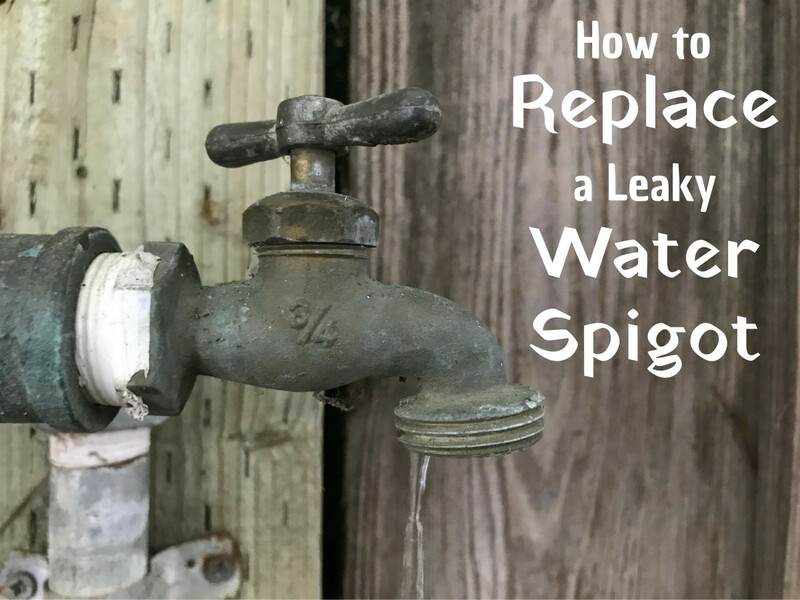 Your other option is to use adhesive caulking (LePage's PL200 or equivalent) to apply the panels directly to the Gyproc wall. If the wall is in good shape and smooth, it should hold quite well. I'm going to build a shed and will buy a framing nailer to build the floor, walls, and rafters, and to attach OSB. But what about the siding and roofing, can I use the types of nails for siding and roofing in a framing nailer? Or will I just need to break out the ol' hammer to complete the siding and roofing on my shed? Most framing nailers have a minimum fastener (nail) length of 2". Whereas, roofing nails are typically 1 1/4". You could probably rent a roofing nailer if you're just doing a shed. Siding nails require a smaller head than roofing nails, so you'll have to check with your local building center to see what's available for the roofing nailer you're going to use. I need to nail down a few flooring transition strips in my home, but also want to use a nail gun for some smaller wood/decor projects. Can a brad nailer do both? Brad nails are usually lighter gauge than finishing nails. For floor transition strips, you want a heavier gauge (16) nails, that will stand up to heavy traffic use. This pretty much dictates using a finishing nailer. You can also get lighter gauge finishing nails for decor projects. Check out your local building center. I’m going to attach 3/8"-thick sheet siding on the side of a building onto 2x4 studs. What’s the best nailer that you recommend? A finishing nailer will work fine. Use about 1-1/4" long 16 gauge nails. If these are subpanels which you're going to cover with a finished material, you could use a roofing nailer for the subpanels and a finishing nailer for the outer material where the nail heads/holes are less likely to be seen. Should I use a 15 or 16 gauge finish nailer for woodworking? I am putting new insulation in the attic. 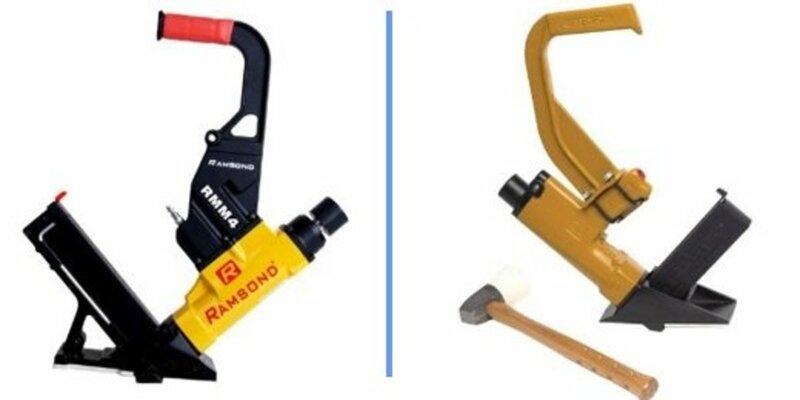 Which nailer should I use for my roof without going through the shingles? You should first investigate the proper way of insulating your attic space. This depends on some factors, including the expected winter temperatures in your region. The attic needs air circulation, so the insulation should NOT block the soffit vents, otherwise, in freezing cold weather, frost will form on the insulation and leak into the house when it melts. 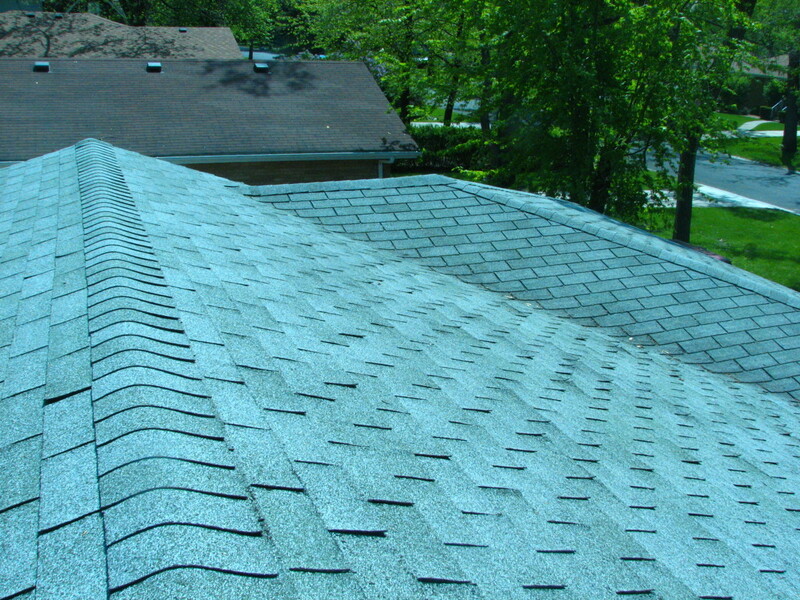 A properly insulated roof/attic also minimizes or eliminates the formation of icicles from the eavestroughs. The roof boards that the shingles are nailed to, are usually about 3/4" to 1" thick, and one or more layers of shingles and a tar paper/protective barrier adds another 3/8". If you were nailing something into the roof boards from the inside, you'd want to use nails that will penetrate the board by at least 1/2", but no more than 3/4". I'm doing some work with old ceiling tin and wood. What nailer would work best to attach the tin to wood? I want to replace my old wooden porch railings and stair railings. What type of nailer would you recommend? If you're going through 2x4's into 2x2's, and you don't want big nail heads or to use screws, I'd go with a finishing nailer, and use fairly long nails (3", 16-18 ga.). Is there such thing as a nail gun that uses U shaped nails heavy enough for fencing? Not that I'm aware of. The nearest thing you could use is a framing nailer, which uses large head nails. With the proper pressure, you should be able to get the nails to sink firmly into the posts and hold the fence wire firmly as well. Not quite as good as the U-nails, but adequate. It depends how much fencing you have to deal with. I'm using sawmill rough cut pine and hardwoods to cover the interior walls on 24 on-center studs of my shed. Some boards are a full 1 inch thick and up to 8 feet long. What size nail gun and nails should I use? Which type of nail gun is good for getting into small places that I need a nail to hold something together? Your best bet would be a Brad nailer, since this is the smallest type available. What is the best nailer for hardieplank ? I'm making blanket ladders using 2x3's. Would a ramset work for that or should I get a finishing nailer? It calls for 2.5 " nails. Most blanket ladders I've seen have 3 to 5 rungs. Depending how many ladders you're making, it may be just as easy to use 3 inch wood screws. Nailers are only a time-saver if you've got 100 or more nails to do. Finishing nails aren't going to hold 2x3's as solidly as either a framing nailer or regular 3" #8 wood screws. It also depends whether you want the screws or nails to be visible or not. You might also consider using wood plugs over the screw holes, which adds to the rustic look of the blanket ladder as well. I want to replace my old fence. I am thinking about buying wood fence pickets 1/2" by 5-1/2" by 6ft. So, what type of brad nailer do you recommend? I would actually recommend a finishing nailer in this case. A brad nailer is for smaller, upholstery type of work. For fence boards (they're typically closer to 5/8" thick), use 1 1/4" to 1 1/2" nails. I'm planning on doing some fairly light framing for a travel trailer. The studs are 2"×2". What type of nailer do you recommend? Assuming you don't want to see large nail heads, use a finishing nailer, with 3" (16-18 ga.) nails. 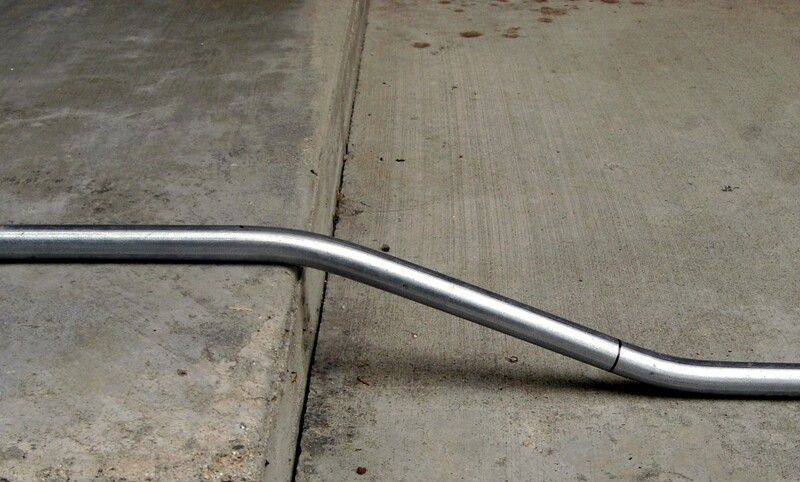 What type of nailer is best for repairs to aluminum siding? The trouble with using a nailer with sheet metal is, except for roofing nails, the other types of nailer's nails have very small heads on them. You need some flat headed nail to hold the metal to the wood beneath. If you haven't got too many repairs to make, you could go back to the old hammer and nails method. It's best to drill a small hole in the siding for each intended fix, before pounding a nail into it. This will prevent a big dimple in the siding where the nail punctures the metal. I own a porter cable nailer f350. Can I use three-inch finishing nails in my porter cable nailer? I couldn't find a model f350. The nearest is a fr350, which is a framing nailer. As such, the nails have larger, round heads. Without seeing this model, I can't say whether it would accept finishing nails. I would imagine that the firing mechanism is sized to shoot large head nails, and it may jam if you tried using finishing nails, even if they fit in the magazine feed. You're on your own on this one..so be careful. I will not be held responsible or liable for any actions you take. I want to use a power tool to set nails in boards for string art. The nails need to be set above the wood, and the nails should have a head on them. What power tool would be best for placing nails into boards for string art? You can try using a scrap piece of wood the thickness of nail protrusion you need. Then drill a hole in this scrap piece, twice the diameter of the nail (head) you intend to use, placing the foot of the (roofing) nailer over the hole, and fire the nail. You'll have to reduce the pressure to the nailer quite a bit, so the nail doesn't go any further than the face of the scrap piece. You'll have to experiment some, of course. Making sure the nails fully penetrate the backing board, but no more than necessary. You're getting into 'non-recommended use' territory here. I'm getting ready to install quite a bit of exterior wood trim around windows and doors. I don't want a nail with a head; I want an exterior finish nail. What kind of nailer should I get? I would suggest a finishing nailer, using a 16 gauge nail. Most of these nails don't have much of a head anyway. The nail shaft is coated with a glue that melts (because of the friction) as it goes into the work. The glue hardens again, holding the parts firmly, thus minimizing the need for a nail 'head' to hold the front piece. The resulting small holes on the trim can then be filled with spackling, sanded and painted. What degree of framing nailer is best to build a deck? For the structural parts of the deck frame (2x8's), a framing nailer is the best type to use. For the deck boards and railings, use a finishing nailer, and heavy, 16 gauge nails, 1 3/4" to 2" long. However, the deck boards may hold to the joists a few years longer, if you use deck screws instead. I am building some cubby shelves from plywood. What type of nail gun should I use? A finishing nailer should do the job. The only problem you'll have is attaching each vertical piece to the shelf below. I would recommend a nail (at a 45 degree angle) near the bottom of the front edge and bottom rear edge, since you probably won't be able to get the nailer inside the cubby spaces. Use a nail length that will almost completely penetrate the shelf below..or longer (2") if the vertical pieces are aligned. Can pin nailers be used on plaster walls? I wouldn't rely on the plaster being strong enough to hold any large piece of wood or trim, unless you locate the studs behind the plaster, and nail into that. Not sure what a pin nailer is. A brad nailer is a lighter duty nailer, intended for upholstery and such. 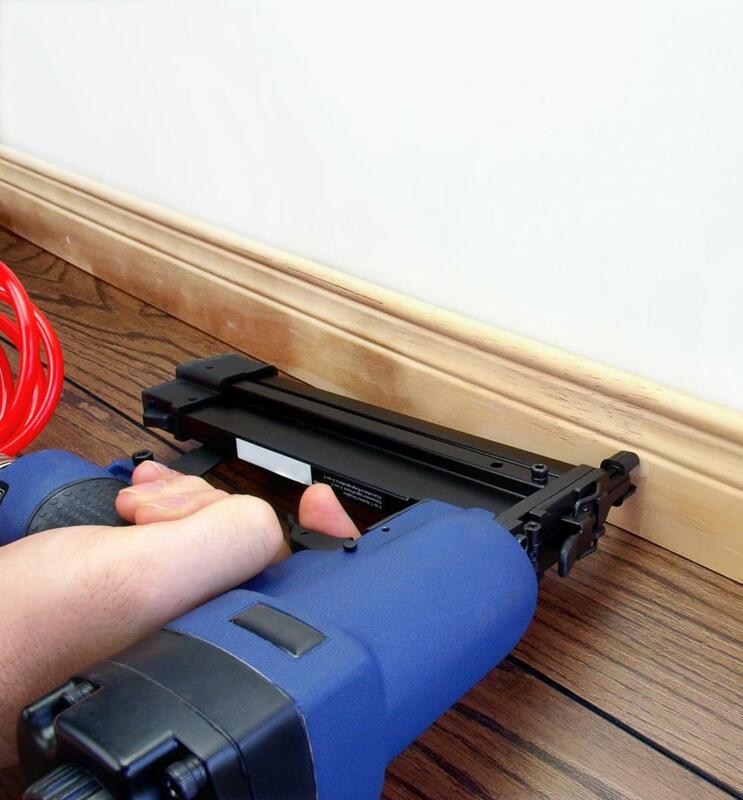 For thinner plywood or panelling and baseboard, use a finishing nailer, and nails that are about 3 times as long as the total thickness of the plywood and baseboard. In other words, the nails should penetrate the 2x4's by about an inch or so. 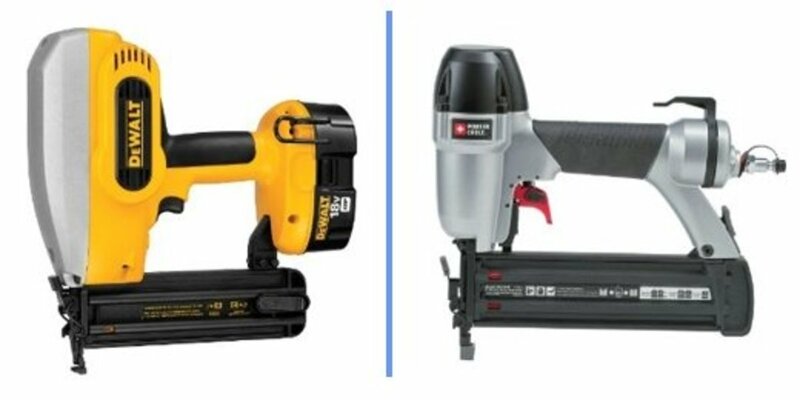 What is the difference between a Pin nailer, Brad nailer, and a Finish nailer? Which is preferable to attach baseboard, and also plywood to 2x4 not covered by sheetrock? i have weak hands and need a lite nailer for some moulding and real wood paneling and other crafts like picture frames and such like hanging stuff on the wall (my new she shed) mostly little stuff is there one tool for me that's electric with a cord or do I need to buy more than one (hope not) thanks for your site good read. Oh man... Nature can be so cruel sometimes..I feel for you. I'm assuming you've made sure the studs are all completely dried out and free of mold residue. A finishing nailer will do the job. You'll want to use heavier nails for the casing (16 gauge), although screws would be better here, as this allows some adjustment of shims to get the casing levelled. It's very important to get all the casing perfectly level on the face and edge, otherwise you won't get the door to hang properly. You should use smaller nails for the trim. Our home’s first floor was flooded following hurricane Florence (44 inches of water). Our home was stripped down to the studs. I am getting ready to install the interrior doors (casing, trim, the whole 9 yards), what type of nailer do you recommend for this install? In spite of the awkward wording, I'll take a stab at it. You're looking for a flooring nailer, which fires the nail at an angle, through the tongue of the flooring..thus hiding (secret nailing) the nail when the piece next to it is installed. Most of these flooring nailers use compressed air, not gas. Although air is of course a gas.. Check the model number of the nail gun you purchased, then go to the manufacturer's website and search for a user guide for that model. They are also likely to have various tips on how to use the nail gun. Yes, you will need a compressor and hose, and the right type of nails for the gun and the job. Your local building center can help you out. Just bought Used one .... Know Nothing except I was told you can install durrock with roofing nails --- Shall I have any Concerns !! Sounds like air compressor is needed!! Tubes are most likly Bad . I read last only about 500 nails . Ugh !! I don't have clue how to check it out ...!!!?????? Indeed, this is very helpful. I was searching all over for some helpful steps of how to use a nail gun safety and properly. I bought three nail guns from different sites online in bunnings. www.hornibrooks.com.au and lowes and glad they assisted me. Thanks for sharing this! Great job! "Can you just buy a one certain nail gun like a finishing nail gun but change the nails like if you wanted to frame instead of buying all the different types?????" Hi Lacreatia; To answer your question..no, not really. A framing nailer uses much thicker and longer nails, and is more powerful. It's built for the purpose, just like the other nailers. 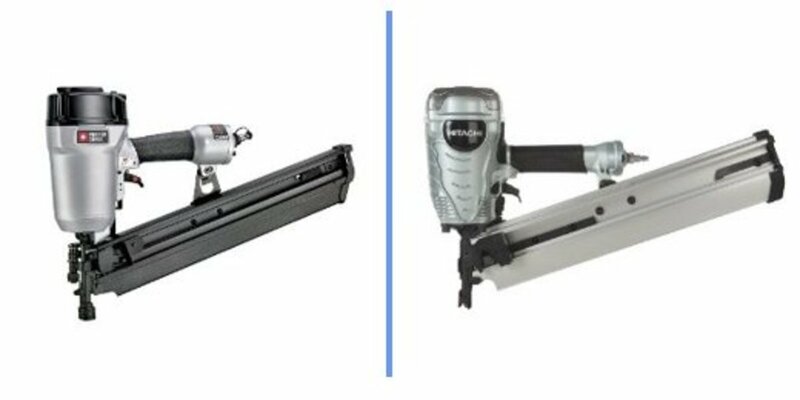 Within the same brand, you may get away with the small overlap in nail sizes between a brad nailer and finishing nailer, but in general they are purpose-built, and the nail magazines are not interchangeable between different type nailers. A finishing nailer is a good all-round device, as long as you're not doing fine upholstery on the one hand, or building a house on the other. A one-size-fits-all nailer would be a compromise, and a lot less efficient, I suspect. Can you just buy a one certain nail gun like a finishing nail gun but change the nails like if you wanted to frame instead of buying all the different types????? Your articles are for when it abstuloely, positively, needs to be understood overnight. Flooring nailers are generally about $100 more, mostly because of the added complexity of a plunger mechanism. Of course the top brand names cost more, but they're generally of a higher quality than the house brands at some hardware stores. Hope that helps. Thanks for checking out the article, sofs. Cheers. Ha! now you don't have to yell after hammering your finger with a nail I suppose and no more black nails . Good one Tim, may be I will look it up!